Are you wanting to clear out old emotional baggage? Feeling trapped by old habits or the Holiday Blues getting to you? Or simply want to enhance your sport performance? Ohana Chiropractic and Wellness Center uses EVOX technology, a revolutionary treatment that allows you to reframe old perceptions to improve health, relationships and performance. We have been using this technology with our patients for over four years and we have seen remarkable results. 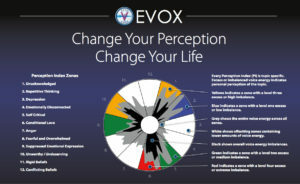 The EVOX technology opens you to new ways of seeing your life through a process called ‘Perception Reframing’ which is the root of effectively dealing with emotional stress. Old perceptions that may be stuck and damaging to your life are released and you become free to choose better thoughts and life patterns. In a session, you will record short “voice maps” on family, and significant people in your life, about big events (such as car accidents and traumatic childhood events), and health and other chronic conditions that are limiting your capacity to be fully alive. The EVOX determines missing frequencies in your voice which are a consequence of buried memories related to the topic you are addressing. The missing frequencies are then broadcast back to you and stimulate and balance the relevant cellular memory connection. During the balancing, you may experience a powerful emotional release or realize insights into stress you have experienced. In the biofeedback process, you may remember old memories, unresolved feelings, or get insights that can help you release old emotional log jams ,freeing you to experience a life you always wanted. Health conditions often involve perception, and reframing on health issues can improve the way you feel and relate to stress. Sports performance, your ability to focus, or become a faster learner at school or work.